January 21, 2018 at 5:42 pm. FOXBOROUGH, Mass. — His right hand was damaged by a midweek injury and Rob Gronkowski was lost to a head injury, but Tom Brady led the New England Patriots back to the Super Bowl on Sunday at Gillette Stadium. Brady threw two fourth-quarter touchdown passes to Danny Amendola, the second a 4-yarder with 2:48 left as New England rallied from behind to a 24-20 victory over the Jacksonville Jaguars in the AFC title game. The Patriots will now go to Minneapolis seeking their second straight title and the sixth of the Bill Belichick/Brady era that began in 2001. The Patriots, winners of 13 their last 14, were down 20-10 after Josh Lambo’s second field goal of the game eight seconds into the fourth quarter. But Brady, playing with tape underneath his right thumb and protecting his palm, joined the New England defense in calmly taking care of business in New England’s seventh straight visit to the conference championship game — the 12th of Brady’s career. Brady finished 26 of 38 for 290 yards. Blake Bortles was 23 of 36 for 293 yards as the Jaguars, playing in their third conference title game, failed to make it to their first Super Bowl — despite the guarantee by cornerback Jalen Ramsey. 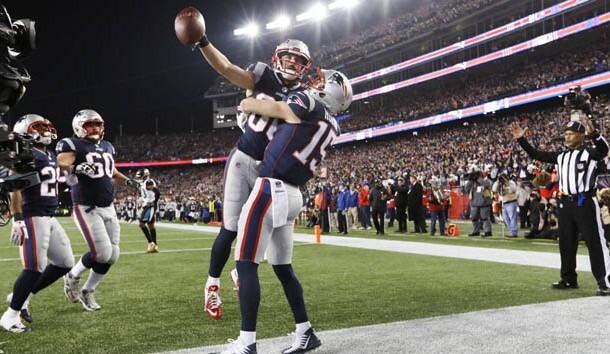 Amendola, who caught seven passes for 84 yards, completed one for 20 yards and had a 20-yard punt return setting up the winning touchdown — became the fourth player to catch two fourth-quarter touchdown passes in a conference title game. Before his first touchdown, he caught a 21-yard pass from Brady on third-and-18. Brady emerged from the locker room and looked sharp in his pregame throwing. Then, the second of his eight straight completions to start the game was a 31-yard bullet to Brandin Cooks. He was 7 of 7 on the drive, but the Patriots had to settle for a 31-yard Stephen Gostkowski field goal after two completed passes lost 2 yards and Brady was sacked for a 1-yard loss. Cooks caught six passes for 100 yards — his first 100-yard postseason game. Marcedes Lewis caught a 4-yard touchdown pass from Bortles and rookie Leonard Fournette, who ran for 76 yards on 24 carries, scored from 4 yards out to make it 14-3. James White scored from a yard out late in the second quarter, but the Jaguars extended their lead to 20-10 when Lambo drilled a 54-yard field goal 4:37 into the third quarter. Before leaving, Gronkowski, who was felled on what was ruled an illegal hit to the head by safety Barry Church, had one catch for 21 yards, the yardage making him the NFL’s all-time postseason leader for receiving yards by a tight end. NOTES: A report from Albert Breer of MMQB broke an hour before the game saying QB Tom Brady suffered a sprained collateral ligament and needed at least 10 stitches to close a wound near his thumb. … RB Rex Burkhead, whose helmet collided with Brady’s thumb, played for the first time since Dec. 17 (knee). … The headline on Sunday’s special section of the Florida Times-Union had the headline: “Bortles vs Goliath.” … Former Patriots QB Drew Bledsoe was the team’s honorary captain, was sent out for the coin toss and presented the Lamar Hunt AFC championship trophy to owner Robert Kraft on the 24th anniversary of his purchase of the franchise.